Ah, Streets of Rage. Sega’s seminal punch-criminals-in-the-groin ‘em up. The nostalgia is strong with this one, as Darth Vader once wheezed asthmatically. This scrolling beat ‘em up franchise made its inaugural appearance on the Mega Drive/Genesis in 1991. 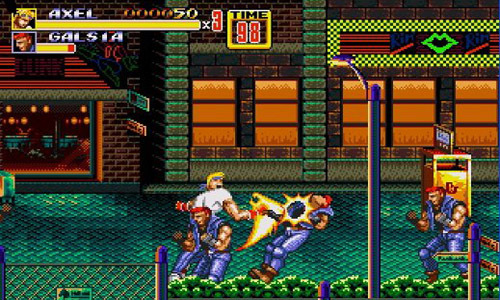 The first game (brilliantly and melodramatically named Bare Knuckle: Furious Iron Fist in Japan) introduced three young police officers, Axel Stone, Blaze Fielding and Adam Hunter, and their mission: to rid the streets of hoodlums at all costs. Their ultimate aim is to infiltrate the fortress of the criminal kingpin, ‘Mr. X,’ and plant their trendy, garishly coloured ‘cool’ trainers –this being the early nineties, after all– squarely in his colon. Or something to that effect. The later two installments of the trilogy (released in 1992 and 1994, fact fans!) deviated little from this template. A couple of playable characters came and went, with craptacular kangaroos and bearded elderly robots getting involved. New special attacks were introduced, dealing extra damage at the cost of a middling drain of your life bar. But the core experience remained inherently Streets of Rage. An experience, moreover, that reaches its true ultra-violent and hilarious potential in co-op. Brawlers such as these are always best in multiplayer; it’s far too gratifying to work in tandem to dispatch a horde of oncoming goons. These games are already vintage classics for their deft blend of weighty combat, inexplicable electro soundtracks and increasingly peculiar settings, but this is a step beyond. The co-operative mechanics of all three titles are, let’s be frank, ballache-ingly bad. Similar scrolling beat ‘em ups like the Simpsons Arcade Game let you perform co-ordinated tag team attacks (Bart and Lisa’s combined running bulldozer… thing, for instance). Here, you can bodily throw your ally into opponents, or take an absurd feet-first leap over their shoulders. The latter of which is almost entirely impossible to aim, and generally useless. This is… desirable, you ask? Most certainly. Such ridiculous touches add much to the entertainment value. With the ever-present threat of friendly fire, a stray fist to your friend’s face can spark a treacherous, hilarious battle mid-stage. Still, the first-come-first-served nature of weapons and items promotes teamplay… or it doesn’t. Most pertinently, though, the games are still as enjoyable and mindless to play through as they ever were. For best effect, though, grab a friend and mop those unfortunate spillages of rage off of the streets together.